Don Bosco Child Labour Mission too celebrated Kannada Rajyotava with children and the staff on November 01, 2018. 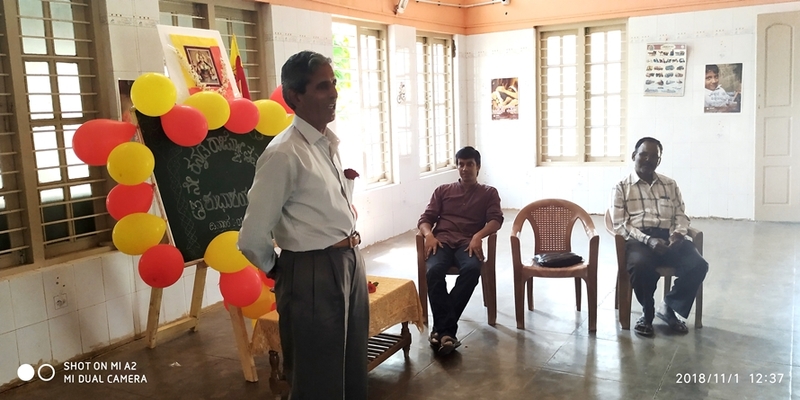 Mr. H S Manjunath, a cartoonist from daily, was the chief guest and he talked on Karnataka and the language Kannada. Kannada is a great language and yet it is very simple. Karnataka has a great culture. It is very nice to write in Kannada. Kannada is the queen of all languages. Mr. Ramanaik Y, social Activist in the CREAM project and CWC Chairperson spoke on the specialty of the day. He spoke on all the poets and the culture and he mentioned that it is Kannada that the maximum number of Jnanapeeta award was given. Kannada has a very rich cultural background, Poems and compositions have contributed a lot to it. Fr. Jose Joseph, Mr. H S Manjunath and Mr. Ramanaik Y were also present during the programme. Mr. Dinesh welcomed the guests to the program. Mr. Nagaraj H proposed the vote of thanks.